Harburn is not a hotel but a private Georgian mansion, situated at the centre of its own 3000 acre sporting estate. It is rented out at all times exclusively making a prestigious, private and luxurious venue for conferences, business entertainment, product launches, incentive travel, weddings and bespoke private functions. Within the estate boundaries are several smaller lodges suitable for overspill or holiday accommodation. 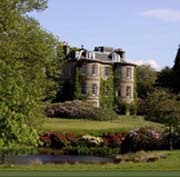 All surrounded by beautifully landscaped gardens, woodlands, lochs and parkland. When you book Harburn we hand it over to you, with a top class chef and fully trained staff. So all you do is enjoy it. Conveniently situated between Edinburgh and Glasgow and only 20 minutes drive from Edinburgh Airport, Harburn is a haven for every type of event. Whether it’s a corporate training programme, the AGM, seminar or forum, Harburn becomes yours from the moment you arrive. So there's nowhere more private for celebrity stay-overs, or top secret merger agreements. Advance planning by dedicated but discreet staff means your visit runs to your exact specifications. Combine the comforts of home with all the efficiency of a well run headquarters, 24 hours a day.